Karamba is a relatively new gaming site offering an impressive range of casino, classic fruit machine games and slots such as Gonzo’s Quest, Starburst and Guns N Roses. 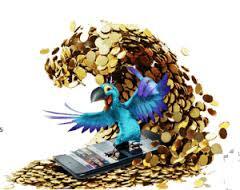 Their eye catching and vivid pages are incredibly enticing, but when you add in the funky parrot mascot, we at Mobile Bingo Bonuses were pretty much hooked. Of course it’s not all about the games, because everyone loves something for nothing and you’ll enjoy plenty of perks with Karamba; because they believe you should be treated like the guest of honour! You can access Karamba via Apple devices, which is unfortunate for the Android users out there; but of course you could always use your desk top. 3rd deposit, 40 extra spins on minimum €20 deposit and bonus surprise. This means you could walk away with a maximum £400, 100 extra spins and a bonus surprise; who doesn’t love a surprise! Even when those impressive welcome bonuses are over, Karamba keep on giving. Their regular promotions mean that simply for staying and depositing you could walk away with bonus spins, bonuses and prizes. The Daily Karamba – Purely for logging into your account each day you could receive extra spins and bonuses. Friends with Benefits – As a treat for remaining a loyal player, Karamba give away regular bonuses such as gifts, tournaments and chat bonuses. Monthly Cashback – You even receive bonus credit simply for playing, with their monthly cashback. The more you deposit and play, the more you can look forward to receiving into your account. Spins Fest – With so much on offer we’re sure you’d be surprised to hear that Karamba still have more to offer. They regularly give away spins on top pay out games, simply for the hell of it! To help you keep up with these incredible offers, make sure you follow the Karamba Facebook and Twitter pages. You’ll be able to chat with fellow gamers, keep updated on any new games and take advantage of those promotions. You’ll have realised by now that Karamba like to be original, so it probably won’t surprise you that this great site send their members a gambling magazine. It’s delivered to your door and is packed with amazing quizzes, entertainment news, gambling tips and tricks; everything you need when you’re not playing. It’s not just welcome bonuses you’ll receive when you join Karamba, because from the moment you register, deposit and play you’ll earn reward points. These points can be converted into additional gaming credit and will excel you through their VIP ladder. There are 7 levels to the ladder including new member, bronze, silver, gold, platinum, premium and prestige; each offering bigger and better bonuses. Some of these bonuses include play Sundays, higher deposit and cash out limits, birthday bonuses and VIP live tournaments. The number of points rewarded will depend on the amount deposited and the game played, but the standard is 1 point for every €20. Although they like to give away points for special promotions or as gifts, so you never know when your balance will increase. Should you require any assistance from the site, you can contact them via telephone, mail or live chat. All details are available on the site and they aim to respond in a reasonable amount of time. There’s also an extensive FAQ section to deal with the simpler queries. Karamba accept a huge range of banking methods including Neteller, Skrill, Credit/Debit Cards, Entropay and Paysafe Card. They currently accept US Dollars, Euro’s, British Pounds, Kroner, Brazilian Real, Canadian Dollars, Australian Dollars and Japanese Yen. Let’s get the party started Karamba style and take advantage of those incredible welcome bonuses!